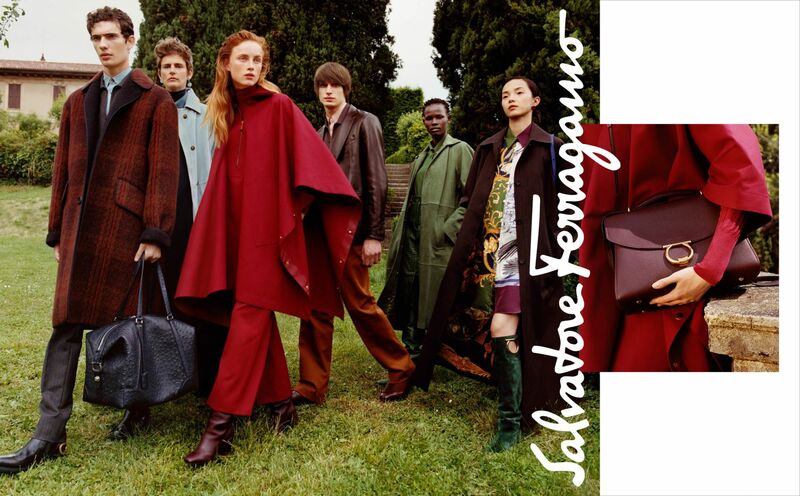 Salvatore Ferragamo reveals Autumn Winter 2018 Advertising Campaign. For Autumn Winter 2018, Salvatore Ferragamo has presented both the Ferragamo woman, and the Ferragamo man – inviting a broad community of models to reflect the glorious multiplicity of today in a patchwork of characters under the creative direction of Paul Andrew. Shot by Harley Weir and featuring Stella Tennant, Shanelle Nyasiase, Rianne Van Rompaey, Xiao Wen Ju, Piero Mendez and Edoardo Sebastianelli, this milestone Ferragamo campaign represents a fresh page in the house’s remarkable history. The new ‘Ferragaristocracy’ as imagined by Andrew is defined by its commitment to progress – because to embrace change is the key to success in contemporary culture. “And her grand-daughter Stella inhabits that refreshed persona with an effortless grace. But in 2018 you don’t have to be to the manor born to have a compelling and stylish manner about you. Punchy colour, rich texture and flowing deformalised silhouettes punctuated with Andrew’s signature Ferragamo shoes, boots and accessories – starring the new Ferragamo Studio bag – make up the grammar of Ferragamo’s revived visual language. Harley Weir deploys her realist’s eye and analogue authenticity to present an imagined house-party whose guests hail from across the globe. What’s brought them together? The newly-rebooted Salvatore Ferragamo aesthetic as defined by Andrew in partnership with Menswear Design Director Guillaume Meilland.